NOTE: This class has past, but the pattern is still available for those interested in making this doll. 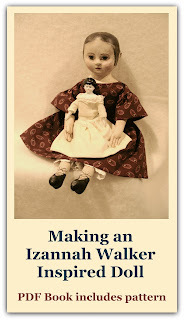 Over three years ago I started studying Izannah Walker Dolls in earnest. Who knew that these studies would eventually lead to developing my pattern? And that would lead to an online workshop. 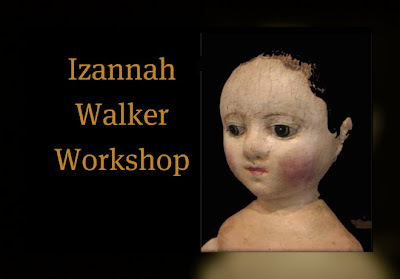 I was so surprised when some long established artists joined the online Izannah Walker Workshop (and a bit nervous, too, truth be told). And even more surprised (and honored) when I was invited to come to England to lead a workshop. Long-distance travel is very challenging for my family as I have a child with special needs, so I had to decline. But E. J Taylor and Lynne Roche will do a marvelous job teaching this workshop using my pattern at the The American Museum in Bath, England. The American Museum has "a remarkable collection of folk and decorative arts, the museum shows the diverse and complex nature of American culture." 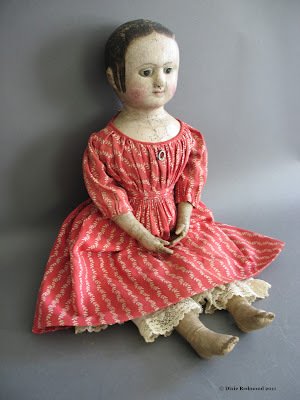 If you live in England, this is a fabulous opportunity to learn about this type of doll from two wonderful doll makers. The two weekend workshop fee WAS £250. Class size is limited, bookings will be taken by The American Museum. It was so fun to read the description of the class! Congratulations Dixie! What an honor! !